Lt. Johnathan Carter was the Confederate Navy officer in charge of naval activities in the vicinity of Shreveport and the Red River. Lt. Carter given the task of building of an ironclad warship in Shreveport, Louisiana in 1863. After much difficulty and improvisation, the final result was a casemate ironclad named C.S.S. Missouri. The Missouri never saw action and was turned over to Federal officers in Alexandria, La. in 1865. Several books and articles state the Missouri was used as a mine layer and a troop transport. However according to it’s commander, Lt. Carter, the boat barley had room for its crew so it is highly doubtful that many troops could have been placed on board. The claim that it was used as a minelayer is also questionable. In one of Lt. Carter’s letters he writes that the Missouri never went further than 2 miles downriver during the period of the Red River Campaign. The same low water that trapped the Union fleet above Alexandria also kept the Missouri bottled up in Shreveport. Order of Lieutenant-General Smith, C. S. Army, to Major-General Taylor, C. S.
Army, for the obstruction of the river with torpedoes. are placed in position the boat and crew will return to Shreveport. Arrangements should be made by pickets and couriers, so that the party on the boat can be notified in time of the passage over the falls of the enemy’s gunboats or the advance of a party of the enemy. I send down by the boat a signal corps, under Sergeant Landry, who will assist in notifying the officer in charge of the torpedo boat of the movements of the enemy. When they get through with this duty they are ordered to report to you. Note that the reference to obstructing the river with torpedoes mentions “an officer of the Missouri”. Further in the text we see this: “the officer in charge of the torpedo boat”. It seems clear that this order sent by General Smith is instructing an officer from the gunboat Missouri to take a boat with 30 torpedoes and a crew down the river and place them somewhere in the vicinity of Grand Ecore. The reference to a “torpedo boat” cannot be the Missouri. A large, slow, unwieldy ironclad like the Missouri would have been useless for this type of mission. Not to mention that the water level in the river was insufficient to allow the Missouri to get that far down river. Off Mouth Red River, La. June 14, 1865. Length over all, 183 feet; breadth of beam, 53 feet 8 inches; depth of hold, 10 feet 3 inches; length of casemate at base, 130 feet 6 inches; length of casemate at top, 105 feet; width of casemate at base, 53 feet 8 inches; width of casemate at top, 29 feet; height of casemate from water’s edge, 11 feet 6 inches; draft of ship (reported), 8 feet 6 inches. The armor consists of railroad iron of the pattern known as T rail, placed diagonally upon the sides of the casemate, with the crowns placed alternately in and out, and locked into each other, and spiked with common five-eighths-inch spikes, one in the center and one at each end of each alternate rail. Upon the bow and stern faces of the casemate the rails are laid vertically and are secured in the same manner as those upon the sides. We suppose that the rails upon the sides were laid diagonally, to prevent cutting. The thickness of the armor is 44 inches, though the rails do not lock closely enough to make it solid. 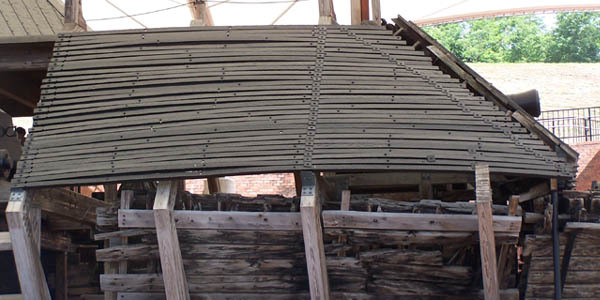 The armor is backed by 23 inches of yellow pine; the casemate at its base terminates in a knuckle, as in the case of the ironclads Tennessee and Atlanta. A pilot house is situated at the forward end of the casemates, raised 19 inches above the deck; the deck of the casemate consists of yellow pine, supported by deck beams of the same material, and is not covered with iron. The forecastle of the vessel and the fantail are protected like the sides of the casemate. We are unable to ascertain how far below the water’s edge the armor extends, but estimate it at about 6 feet. There are two gun ports in the bow face of the casemate and three in each side, opposite to each other, with corresponding gun circles upon the gun deck. The vessel is propelled by a single wheel contained in a recess in the after end of the casemate, but extending 8 feet 4 inches above its top and entirely exposed. The dimensions of the wheel are as follows: Diameter, 22 feet 6 inches; buckets, 17 feet long, 22-inch face. The armament consists of three guns. No. 1, a Dahlgren XI-inch gun (F. P. 115), said to have been Captured on board the Indianola. It is mounted upon an ingeniously contrived pivot carriage, the side of which is composed of T rails. 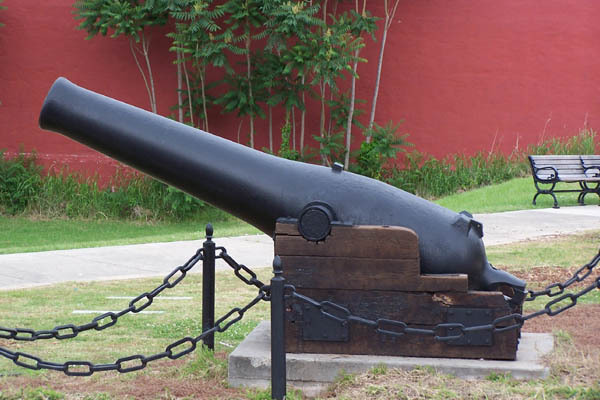 This gun is placed to fire from the starboard port of the bow of the casemate or to pivot to the starboard forward broadside port. No. 2 is an old-fashioned 32-pounder siege gun, mounted on a carriage similar to that of No. 1, and placed to fire from the port bow port or to pivot to the port forward broadside port. No. 3 is a Dahlgren IX-inch gun (F. P. 572), also said to have been captured on board the Indianola. It is mounted like the other two guns and placed to pivot to either broadside from the after ports. IX inch Dahlgren, downtown Vicksburg, MS. There are gun circles for the center broadside ports, but no gun. The woodwork appears to be generally sound, though the vessel leaks quite badly. The interior arrangements generally are poor. The officers’ quarters consist of a sort of cabin in the after part of the casemate and of a few berths for the wardroom and steerage officers on the orlop, abreast the engines and wheel. There are two magazines and two shell rooms forward, one on either side and abreast the boilers. We did not deem it prudent to open them until the vessel is more to rights. There is quite a large amount of ammunition on board. The machinery consists of two poppet-valve engines, connected to the shaft at right angles, and of the following dimensions: Length of stroke, 7 feet 6 inches; diameter of cylinder, 24 inches. Four double-flued boilers, 40 inches in diameter and 26 feet long; the flues are 15 inches in diameter. The boilers are placed fore and aft in the hull with the fire doors forward and furnished with a single smokestack. There is one doctor engine for supplying the boilers. One small donkey boiler, 8 feet long and 26 inches in diameter. Two small donkey engines, one for running the capstan the other for running a fan blower of 3 feet in diameter and 14-inch breadth of blade. Also one small steam pump. The machinery and boilers are in a very bad condition, and a large amount of repairs would be required to render them fit for service. The steering gear consists of three balanced rudders, placed under the fantail. The steering wheel is exactly under the pilot house, upon the gun deck. We estimate the value of the hull, armor, and machinery of the vessel in their present condition, the ordnance and other stores on board, at about $100,000. JNO. SWANEY Acting Volunteer Lieutenant. Lieutenant-Commander JAMES P. FOSTER Commanding Third Division Mississippi Squadron.